I put this on the forum because I thought it was more of a conversation piece than a bargain. Too bad the price is so high, it would look great in the shop at the museum. I know of one that's been in a garage like that for at least 55 years. I had a NOS block years ago, but not in the original crate. I sold it for less than that ebay price. Thats a bargain because everyone knows you get the floor boards with it! No thank you. I already have one and mine is newer. How does one find a 90+ year old block that isn't even finished? I knew a guy who had an NOS T block, and the block was cracked. Hmmpph........looks identical to my 1918 block, which is DEFINITELY not new. After all the money I put into saving it, I'd have been better off with the Ebay block! All part of the hobby thought. GOOD ONE !! Dallas I recently had a "Ford Scholar" at a car show tell me the packing crate story. I was actually taught that in a transportation class in college it wasn't in the book, it was the professors comments. You know, I just noticed..........none of the machining operations have been done! So, what you're buying is an "interesting" lump of cast iron that needs a couple thousand worth of machine work done! The block shown above is not the one in the Ebay listing, which is a 26/27 block. Yes, Joe and Matt are correct. It's one of the T-100 blocks that has a thin wall around the water inlet and it wasn't machined up as a result. And Ed, Seriously? Isn't it bad enough that I'm married to a former Dodge employee's daughter? Someone, someplace, must have an crated Nos T chassis sitting around. I have noticed that as time goes on, NOS parts that are not in their original packaging, or are not fully finished tend to be either defective or "seconds". I am learning to be rather cautious about buying NOS over good used. Well, Ok. Tom isn't really that old. I made that up. 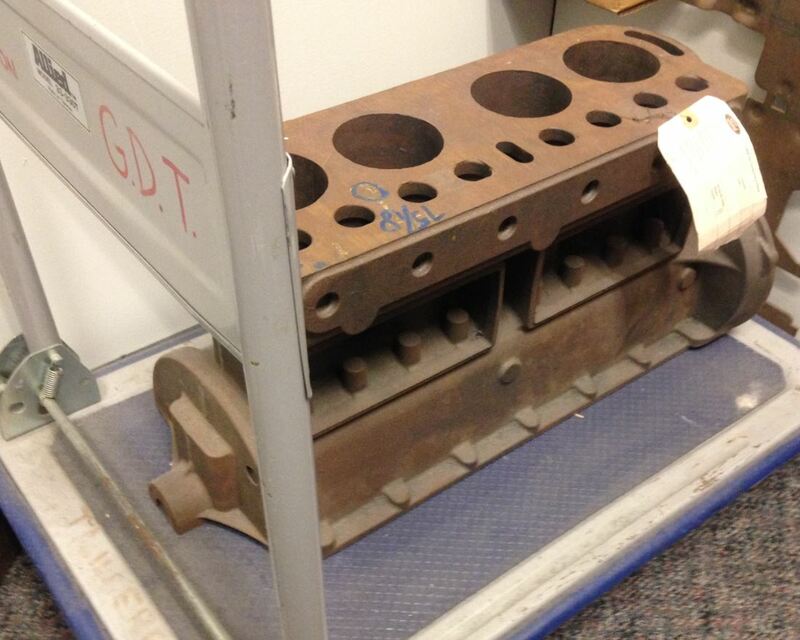 The block is actually an award from Ford's Garage in Dearborn. It seems that someone was the first to use the onion ring dispenser as a beer bong. Ed,That is some crate! I can't believe that they crated a large number of chassis. Seams to me that wouldn't be very cost effective. 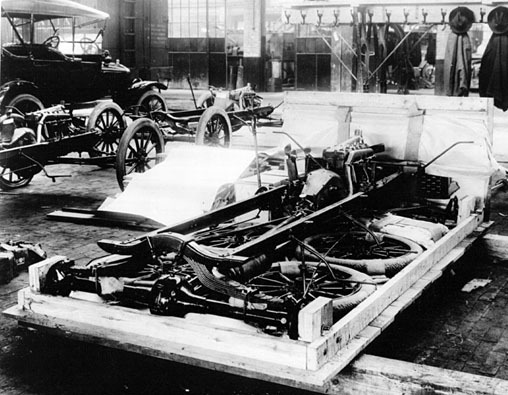 This may also have been before Ford built assembly plants all over the country. Wonder if it came with plans to cut the wood for a truck body? Looks like the crate was for ocean shipping. With ocean shipping, you are charged on a "measurement ton" basis (except for really heavy stuff). That means you want to minimize the overall height, width and length of your shipment. My Army unit handled freight guidance for the entire Department of Defense. You wouldn't believe how much they saved on shipping by removing the exhaust stack on a road grader!